We were recently asked to take the Love Your Mouth challenge from GlaxoSmithKline, who make leading toothpaste brands such as Sensodyne, Corsodyl, Poligrip and Aquafresh. The aim of the challenge is to get people to understand that everyone’s mouth is unique and will have different needs, so using specialised dental products is important. You simply complete an online quiz, either for yourself of your kids which asks questions about your dental health – for example do you spit blood when you brush, do your teeth twinge when you sip hot drinks and do you wear a partial denture. Depending on your answers, your recommended dental product is shown. 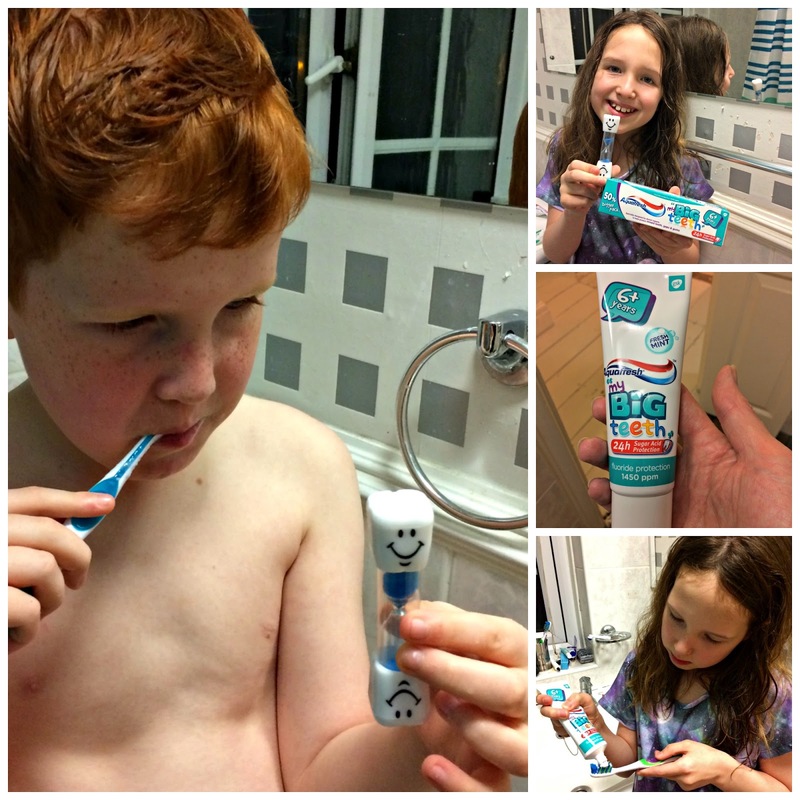 I completed the quiz for Caitlin and Ieuan and was recommended a brand with which we are already familiar and have used many times – Aquafresh My Big Teeth – since they are both over 6 years old. We have used Aquafresh Milk Teeth and Aquafresh Little Teeth toothpastes too as dental hygiene is so important for good health and we have ensured that the kids have stuck to a strict teeth-cleaning regime from the moment their teeth started to appear. We make sure that they both brush for the recommended 2 minutes each time and we were sent a sweet little ‘tooth timer’ to make sure they stick to this time properly. You can also download the Love Your Mouth app which lets your kids brush a long to a song for 2 minutes. Did you know that children’s enamel is 50% thinner than an adult’s? Their teeth need a little extra care to help avoid tooth decay and ensure they grow healthy and strong. You can find some top tips about how to get your kids to look after their teeth and gums in this video. Aquafresh My Big Teeth with Sugar Acid Protection is a gentle, foaming toothpaste specially designed for children six+ years plus. The Sugar Acid Protection helps strengthen enamel and protects not only their milk teeth from decay, but also their new adult teeth. Aquafresh My Big Teeth comes in child friendly mint flavour. It is priced from £1.20 and available from Tesco, ASDA, Sainsbury’s, Morrison’s, Waitrose, Boots and Superdrug. Are you guilty of any of those? For more information on the Love Your Mouth challenge go to LoveYourMouth.co.uk. *PR samples were received for the purpose of this post. "House of Lords Communication Committee To Examine The Safety Of Children Online"